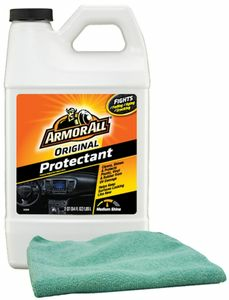 The Armor All Protectant has been used by more than 90 million people in over 75 countries. With four times more UV blocking ingredients than the number-two brand, it guards against dashboard cracking and discoloration. It's also safe for hundreds of other products, including boats, patio furniture, sporting goods, sealed wood/finished leather furniture, luggage and shoes, vinyl siding and more. The Armor All Protectant guards against discoloration and cracking caused by ozone, UV radiation and extreme temperatures. It restores a new look instantly by removing grime that can wear out the vinyl, rubber and plastic parts of your car. The Armor All Protectant is non-toxic, and contains no alcohol or solvents.